I've had the most amazing past six months. I had a sabbatical, 6 months off, to Sort through, sift through, shift, swim and get my Strength back. After a 14 month run for the US House of Representatives, I was "fried". The exhaustion of my race, however, was overshadowed by the freneticism of the Presidential race. So every day, whether we wanted it or not, the headline stories were about who would (or would not) win the Presidency. Pollsters, pundits, media contributors and reporters, got it all wrong. While the world was and still is spinning about the election, the days and nights are passing us by. It is December 30th, the eve of New Year's Eve. I would like everyone, to exhale, and do what my late grandparents used to say "Sit down and rest your nerves". One of the things one sees as you slow down, is just how FAST people and things are going. People have become oblivious, or anesthetized, to the pace and the pain caused by moving too fast. We live in not only a technological era, but an era of rapidity. Going so fast, at lightning speed, so fast, we sometimes, "lose ourselves". So now that the gifts are unwrapped, and the mistletoe are hanging, I invite Americans to STOP and finish strong. Don't spend the next three days thinking about and planning New Year's resolutions. Sit yourself down, and enjoy the "here and now", the remainder of THIS year. Let it SIMMER like a good cup of coffee, or a good stew, allowing all the ingredients, of your life, to blend together. For the next 24 hours, do not rush for ANYTHING, not the bus, nor the train, nor eating, nor even to get your spot in Times Square. Let your mind, body and spirit catch up with one another. I call it "Catching up with myself". Make STRONG decisions---and stick with them. And I've learned you can't make decisions when you're too tired, nor moving too fast. So slow down, and decide what is you want or DO NOT want. It's your life. Decide WHO and WHO not to be around. It's your world. Decide who gets a front row seat in your life. It's your stage. .Decide how and when you're going to slow down long enough to be Strong enough, to finish what you started. 2016 has 24 hours left. Subtract 8 hours for bedtime. Subtract three more, for meals, turn off the TV, and then add up your hours left to get to the 2016 finish line. After I returned from my tenure in DC as Ambassador at Large, I walked over from my apartment, in Harlem, to Fifth Avenue, to see the set up for the NYC Marathon. I had never been that close. However, I watched intently. From where I watch and live, the runners still have about six miles to go. It is closer to the end than when they began. But they are not "there" yet. Some of their legs cramped. Some needed water. Others had orange slices in their mouths. One of my friends and Delta sorors from Houston, was in Harlem, running this race. We screamed with joy as we saw one another. I could not hold her up. She had to get to the finish line. I had to let her go, and she had to release her arms from around me. She still had something to do. She would not be the #1 runner. That did not matter. 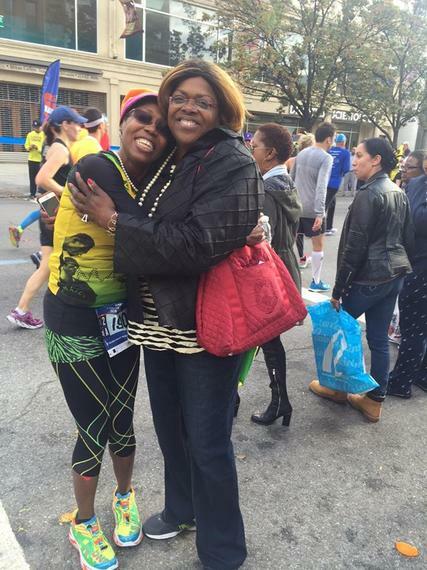 What mattered was that she get TO the finish line. She had prepared for this day. She could not run with others. She had to do this part alone. And that's what FINISHING strong really means. No one is going to carry you. No one really likes the song "Lean on me when you're not strong, and I'll be your friend..." No, what it really means is if you have to depend on someone else to get you to the finish line, you just might miss it. 2017 is waiting for YOU, but there's something you must do first. Finish 2016. Finish strong. Give thanks for your life. "Sit yourself down, and rest your nerves".